Astronomers have used a novel technique to reveal the hitherto unsuspected presence of protoplanets in orbit around a young star. Although more than 3000 fully formed ‘exoplanets’ have now been discovered in mature star systems outside our own, much remains to be learned about how planets evolve. 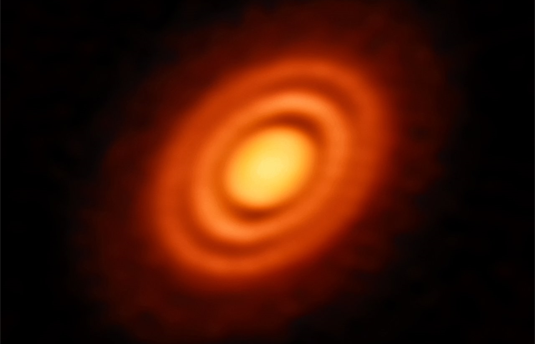 It is now accepted that planets are born in protoplanetary disks filled with gas and dust that are associated with young stars. Unfortunately, the techniques used to find fully formed exoplanets cannot be applied to the detection of young protoplanets in such systems. But now an international team of astronomers, which included LMU physicist Til Birnstiel, has used a new approach that has enabled them to discern the tell-tale signs that the disk which encircles the star HD 163296 hosts two protoplanets. In parallel, a second team has employed a variant of the method to show that the system harbors a third planet. Both papers will appear shortly in Astrophysical Journal Letters. “A few years ago, the first hints of multiple ring structures were discovered within the gas and dust that make up protoplanetary disks. These faint rings were taken to indicate the presence of young planets,” Birnstiel says. “However, the possibility could not be ruled out that alternative mechanisms were responsible for the formation of these rings,” he adds. Taking advantage of the high resolution attainable in at radio wavelength with the Atacama Large Millimeter/Submillimeter Arrays (ALMA) – an international radiotelescope located high in the Chilean Andes – astronomers have now tackled this issue using a completely new approach. They used ALMA to measure the distribution and the radial velocity of the carbon monoxide gas within the disk around HD 163296, looking for perturbations in gas flow that would signal the presence of protoplanets. The star itself is about four million years old and some 330 light-years from Earth.